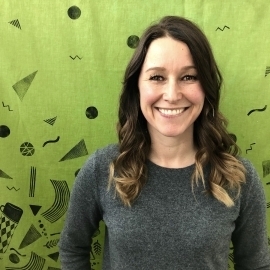 Sadie began working for the MCA as the marketing and programming manager of the Center for Maine Craft in 2009, became Director of the Center later that year and now serves as Executive Director of the MCA. She grew up in New Hampshire, where her mother lived and worked as a professional ceramic artist. Her credentials include receiving a Masters in Arts Administration from Boston University, serving as director of artSTRAND an artist-owned contemporary art gallery in Provincetown, and managing CRAFTBOSTON, a craft show exhibiting more than 200 artists and serving as the event coordinator for Salad Days at Watershed Center for the Ceramic Arts. Additionally, Sadie co-founded and directed a gallery and studio space in Portland, Oregon and has worked with the Maine Arts Commission and The Mayor of Boston’s Office of Arts facilitating public art programming, and conducted market research at The Boston Center for the Arts. While in Boston Sadie lived and worked as a studio artist at The Distillery where she organized and participated in semi-annual open studio events and collaborated with Rope-a-Dope poetry and printmaking press.